The award-winning unique, horror game show from Primal Media returns for a brand new, all celebrity series. 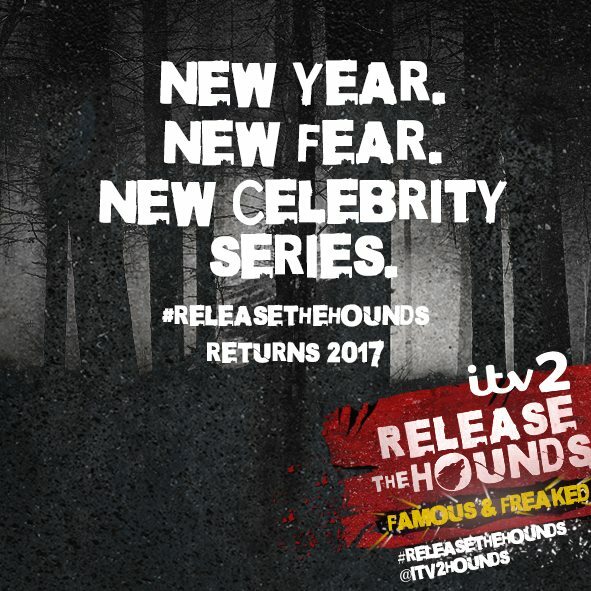 Release the Hounds: Famous & Freaked will air on ITV2 in 2017. With scarier and bigger challenges than ever before, the scream out loud horror experience has upped the ante for its new series with gruesome and horrifying tests that aim to push the celebrities to the very edge. Celebrities competing in this brand new 7 x 60 minute series include TOWIE faces Pete Wicks, Bobby Norris and Chloe Sims; I’m A Celebrity Get Me Out Of Here stars Stacey Solomon, Hugo Taylor and David Morgan; Youtubers Alfie Deyes, Joe Sugg and Marcus Butler and Geordie Shore’s Marnie Simpson, Chloe Ferry and Nathan Henry. Reggie Yates returns as host. Filmed in a remote forest from dusk through to the dead of night, each episode sees three celebrity faces compete in some of the scariest challenges ever endured on TV to win money for their chosen charity. They will have to face horror themed mental and physical challenges aimed to truly push them to their limits with the ultimate challenge for them to out-run a pack of dogs, trained to guard the cash. If they manage to escape the hounds, the money belongs to them. Release the Hounds: Famous & Freaked was commissioned by Kate Maddigan, ITV’s Commissioning Editor for Entertainment. The Executive Producers are Adam Wood and Mat Steiner.